We are proud to present a bustling series of free, public performances and educational programs throughout our area. 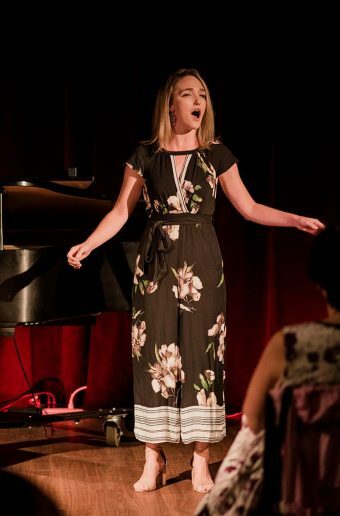 Our goals are to raise awareness of the arts, to enhance the quality of life, and to educate audience members about the magical art form that is opera. Enjoy these surprising opera “bites” for any size crowd. Picture this: you’re sitting at your favorite restaurant, enjoying a lovely meal. All of a sudden, a group of professional opera singers breaks into a rousing quartet, elevating your evening to a (literal) high note. This is the magic of our “pop-up” mini-performances, which we regularly bring to restaurants, community events, and more! These quick, “flash-mob” style performances will whet your appetite for opera in just a minute or two. Let us serenade your group this season. 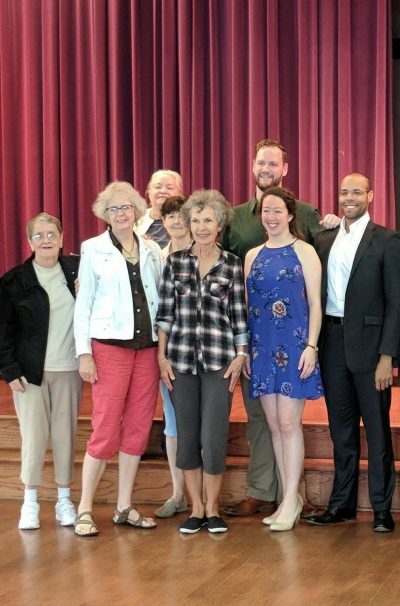 Our Artists in Residence regularly visit retirement communities, assisted living facilities, church groups and more with varied programs of arias, musical theatre favorites, and favorite duets! Complete the form below to request more information about bringing live performances to your group. Join us each month during our season for a lunch break performance by our Artists in Residence. Bring a lunch and enjoy it while you listen to favorite arias, duets, and popular songs. All Brown Bag performances are at 12 PM @ the Opera Center. Learn about the intersections of art and music. 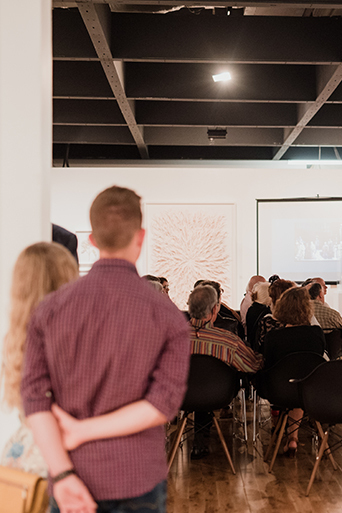 Look at opera in new ways with our recurring series of Gallery Talks with the Pensacola Museum of Art. 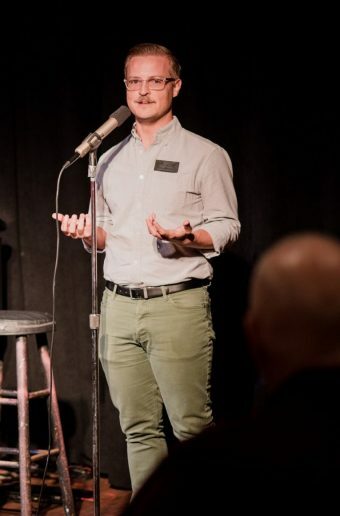 These hour-long presentations in anticipation of our mainstage productions introduce audience members to visual and performing arts in new ways, featuring speakers from the opera and art curators in collaboration. Find future Gallery Talk events on our event calendar. 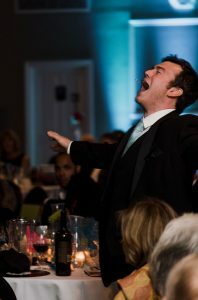 Enjoy an upscale tableside performance by rising opera stars! Each spring, we partner with Jackson’s Steakhouse in Downtown Pensacola to present an intimate concert of beloved arias and duets while guests enjoy an upscale evening at one of the aria’s premiere restaurants. Check our event calendar in Fall 2019 for our Spring 2020 Dinner & an Aria performance date. Reservations are made directly through Jackson’s. Become a more informed audience member. 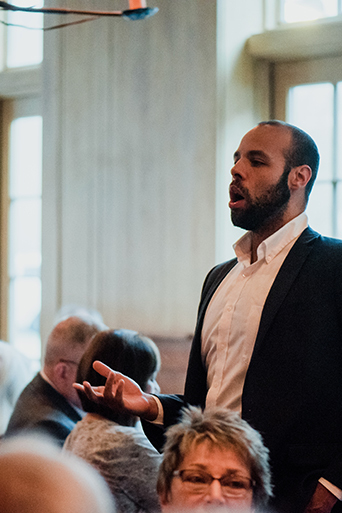 Join us for year-round opportunities to learn more about the operatic repertoire, our upcoming productions, and the people behind the scenes with educational presentations of various types. Is there something you’d like to learn about? Contact Cody Martin, Director of Education, with any suggestions for upcoming discussion topics!